Greens Party - Protecting Native Fauna? The government frequently refers to the ‘sustainable harvesting of renewable resources’ meaning killing kangaroos and native animals. We don’t have a problem with green businesses using native flora but we do have a problem with businesses using native fauna. It sounds like the Greens party supports the kangaroo and possum killing industries, or may openly do so in the future. In Tasmania the commercial possum industry almost wiped out the ring tail possum – and now they are trying to start up the brush tail possum industry for export to China. The fact that the greens have no policy expressing opposition to the commercialisation of wildlife is a serious concern. Nor is there any ‘Animal Welfare’ heading in this Policy Summary booklet. In fact right now the Greens in Victoria are trying to lift the ban on commercial kangaroo killing. Meanwhile in the ACT there is yet another horrific government cull of thousands of kangaroos in no less than seven Nature Parks in Canberra – met by total silence from the ACT Greens. Where is the implementation of their policy ‘native animals and their habitat must be protected’? If the Greens are trying to capture more rural votes, this is sure to backfire as every animal welfare/animal rights/environmentalist I know who currently votes Green certainly won’t continue to vote Green if this is the case. The Greens will lose more votes than they will gain. Besides there is a new party called the Animal Justice Party - http://www.animaljusticeparty.org - who probably won’t give their preferences to the Greens if they have a policy that could wipe out our national icon. It’s impossible and unviable to replace the livestock industry with the kangaroo industry. 1. Kangaroos cannot be farmed. They are very highly strung animals. They can’t be herded, transported, or have procedures done to them. They suffer stress myopathy and die, their meat becoming rancid. They need 2m high electrified fences, which is very expensive. They need huge areas to exercise and won’t tolerate being kept intensively like livestock. 2. It’s not viable to replace beef with kangaroo meat. Kangaroos have very little edible meat. A fully grown 10 year adult (if you can find one) that weighs 60-70 kg yields only 6.9 kg of meat, 0.25 kg of which is human grade. The majority of kangaroos killed these days are only joeys 2-3 years of age, barely reproductive age, just out of the pouch, who weigh only 21 kg. Compare that with a 2 year old cow weighing 200 kg or a 6 month old lamb weighing 20 kg. To get enough kangaroo meat to replace 1,700,000 tonnes of beef the entire population of kangaroos would need to be killed 566 times over every year. •	regenerating native grasses – seeds fall into footprint and buried in hole left by toenail. Tail drags behind while grazing pressing ground, rolling seeds into earth. Kangaroos are considered a ‘pest’ but in fact they are integral to the biodiversity of the region + help offset damage by livestock and rehabilitate the land after drought and fire. 4. The Greens need to seriously consider the health risks to the community of recommending game meat like kangaroo which is mainly eaten rare or undercooked, dried or cold-smoked because it tends to be tough. According to wildlife pathologist Dr David Obendorf, kangaroo, possum and the meat of native animals contains bacteria, viruses, fungi and parasites (like Trichinosis, cysticercosis and toxoplasmosis) including nematodes that eat muscles. It’s important to remember that many of these parasites are microscopic and cannot be seen by the naked eye:- (Pass out picture here). Recent international scientific reports say that raw game meats are potentially infectious. Russia banned kangaroo meat in August 2009 due to contamination issues (salmonella and ecoli). A high percentage of wallabies carry toxoplasmosis, besides other wild animals, which causes abortions, infertility and death. 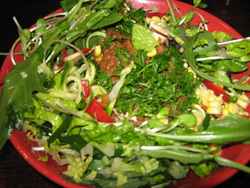 Over the years many people have had acute clinical disease from eating native animals. In 1995 the Womans Day reported a case where 12 people contracted toxoplasmosis from eating rare kangaroo meat one of whom was pregnant and her baby was born blind. In Tasmania a man who ate a lot of game meat contracted inexplicable muscle weakness that went on for years. 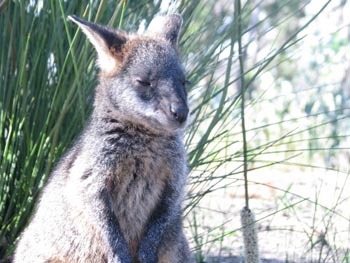 A NZ tourist got similar infection after eating wallaby meat in Tasmania. In fact Tasmania has endemic trichinosis in its wildlife and 2% Tasmanians have antibodies to muscle-encysting Pseudotrichinosis. In spite of this the Dept. in Tasmania that permits game meat industry denies any public health risk. In the last 25 or so years, of 35 new infections in humans, 20 (57%) have been zoonotic in origin (i.e. passed from animal to human) - with devastating consequences. In areas where they used to be abundant they are now becoming locally extinct. Shooters are hanging up their guns for lack of kangaroos to shoot. Because shooters have killed the biggest males the gene pool has diminished meaning the kangaroos are getting smaller – a lot smaller. From 2001-2006 kangaroo populations fell up to 70% due to the kangaroo industry and the drought yet the quota stayed high. This year it is 3.8 million (which does not include joeys numbering up to 1 million a year). 6. Negative affect on tourism. People come here to see kangaroos and are disappointed not to see them in the wild. Kangaroos are the 2nd most recognised tourist symbol. It’s an $85 billion industry compared to only $270 million to the kangaroo killing industry. Clearly kangaroos are worth more alive than dead. 7. Last but not least, there is the cruelty inherent in this industry. 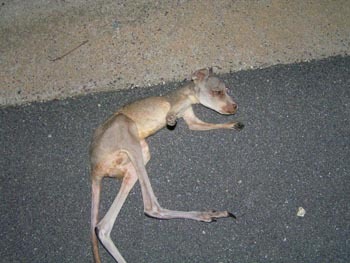 If people only knew how the baby kangaroos are killed they would never support this industry. According to the Code of Conduct for the Humane Killing of Kangaroos it is perfectly fine to take a baby from its dead mother’s pouch and bash it to death against a truck, take a knife and cut off its head or stomp it to death. The at pouch joey that hops away will die of starvation, cold or predation – in terror. It cannot live without its mother for the first 14-18 months. It’s a brutal industry that is unmonitored. Kangaroos are shot at night in the bush – not all are head shot. Some are shot in the neck or body, some have their face blown off and hop away to die of starvation and gangrene, their babies dying when they die. Some are still alive while they are being disembowelled. This is the largest slaughter of land-based wildlife on the planet happening RIGHT HERE and the GREENS IS DOING NOTHING ABOUT IT! If the greens truly does care about biodiversity, why aren’t they protecting our native species i.e. kangaroos and their habitats like they protect whales? Australia desperately needs a party that will reverse the rampant biodiversity loss that is accelerating out of control. Given the above, I am wondering why the Greens Party does not have a policy of recommending a plant-based diet? Could the Greens be thinking that the kangaroo industry could replace the livestock industry? If so, they need to realise that there will never be enough native animals to support or replace all the meat eaten from sheep, cows, pigs and chickens without them being driven to extinction. If every Australian ate kangaroo only once a week, we would need to kill 96 million kangaroos a year, which is 4 times more kangaroos than exist today. Clearly, not a sustainable choice for 7 billion people most of whom want to eat flesh. Australia is desperately overdue for a makeover when it comes to our attitude to our iconic native animals which get a bad rap for being pests, in plague proportion, attacking cars on the road, attacking dogs etc. Because of this we have the worst record of wildlife extinctions on the planet. We are in the midst of a 6th Mass Extinction event. The government's policy of sustainable harvest of renewable resources being applied to living sentient beings with strong bonds to their young and ability to feel emotions is so wrong and there is a crying need for a party who will stand up for them. Will it be the Greens? The Greens have a unique opportunity to pave the way forward for a truly sustainable future for Australia by recommending a plant-based diet. I would like to see them take a principled stand based on what is best for the environment, even at the risk of offending those businesses that currently use native animals and those who are culturally addicted to meat and dairy. See http://www.youtube.com - ‘Food that Kills’. * Oppose unsustainable population growth. This is the single most important factor that is wiping out our wildlife due to encroachment on their habitat. The Greens have been a very forward-thinking party when it comes to the environment and truly enlightened. But now it’s time for them to be unified with the animal protection groups if they are serious about protecting native habitats and their species. United we stand – divided we fall. 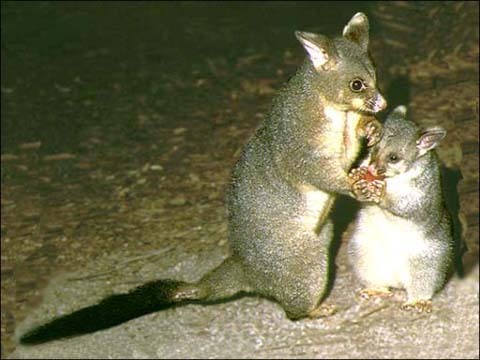 The Department of Primary Industry, Parks, Water and Environment have compiled a Management Program for 2010-2014 in order to justify commercial trade of Brush tail possums in Tasmania. These innocent native animals are permitted to be poisoned, shot under crop protection permits, commercially traded and exported, shot for ‘other’ approved purposes. The issue of crop damage by possums has not been accurately quantified and is difficult to isolate from damage caused by other grazers. Footage gained in 1999 by an animal welfare group revealed inherent and brutal cruelty in the abattoir owned by Lenah Game Meats. Recent video footage of BT Possums being slaughtered in Mr Kelly’s abattoir in 1999 demonstrated clearly that many animals were NOT stunned immediately and were attempting to escape in terror. When BT Possums are trapped, transport can take up to 4 hrs during daylight and once reaching their destination can be caged for a further 24-48hrs. This is unacceptable and would place these sensitive nocturnal creatures in a constant state of stress, panic and fear. Where is the voice of Tasmanian Greens to stop this "use" of wildlife to supply skins to China? China already has a horrific record of animal abuse, especially within the fur trade. We are simply endorsing it by the "use" of BT possums in Tasmania. The footage taken inside John Kelly's Tasmanian possum abbatoir could not possibly have escaped the attention of the federal or Tasmanian Greens. At the time it was a very prominent issue and the ensuing legal battle between Kelly and the ABC's "7.30 Report" was a landmark case involving the public broadcasting of footage that may or may not have been legally aquired. It would be morally bankrupt for the Greens to ignore the abhorrent cruelty clearly depicted in this video. It should also be pointed out that the owner of the abbatoir, John Kelly is also the head of the Kangaroo Industry of Australia. More information on Kelly and his abbatoir including the footage itself can be found here. Is John Kelly related to Martin Bryant?